When Patagonia announced it would donate $10 million (the entirety of its savings from federal tax cuts) to environmental protection groups, the company received an outpouring of gratitude from people who support the brand’s deep-rooted values. TOMS Shoes entire business model is built on helping those in need. What started as a campaign to buy a pair, give a pair has gone on to include many other areas of social impact. For brands like Patagonia and TOMS, having a true purpose in the world is at the core of the company. This type of brand activism produces a fascinating outcome: it rewards brands with more conversations, new buyers, and greater customer loyalty. But why are consumers lining up behind these brands with a purpose? Is it a follower mentality, or is there something deeper? To help us understand, let’s take a look at current perspectives and behaviors among consumers. Ten years ago, if you created amazing brand experiences and delivered excellent customer service, you probably had customer loyalty on lock. Today, it isn’t enough. 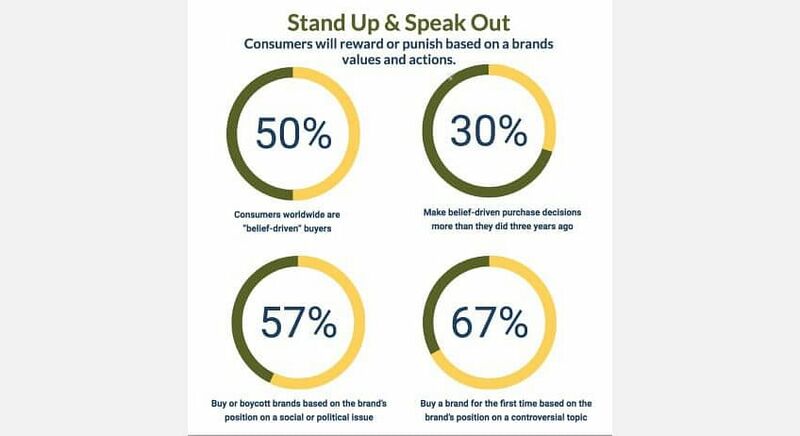 Consumers want brands to take a stand on issues - in fact, 88 percent said they would buy a product from such brands, and 66 percent said they would switch from a product they typically buy, to a new product from a purpose-driven company. Clearly, consumers are voting with their wallets, and loyalty goes to the brands with a purpose. When consumers align themselves with a purpose-driven brand, it is because they feel a deeper connection based on shared beliefs and values. Thirty percent of consumers worldwide say they make belief-driven purchases more than they did three years ago, according to a recent study by Customer Insight Group. Seventy three percent of Americans said they would share information or stories about purpose-driven brands. Whether people are making purchases or sharing content on social media, consumers choose brands with a cause because it allows them to become a part of the solution. Words, as well as wallets, are the currency needed to push progress forward. And people will choose brands that empower them to make a difference over brands solely focused on making a profit. Interestingly, it isn’t just the impact brands are making in the world at large that matters to consumers. Sixty-seven percent of Americans are lining up behind brands with a cause because they feel these companies care more about them and their families than traditional brands. 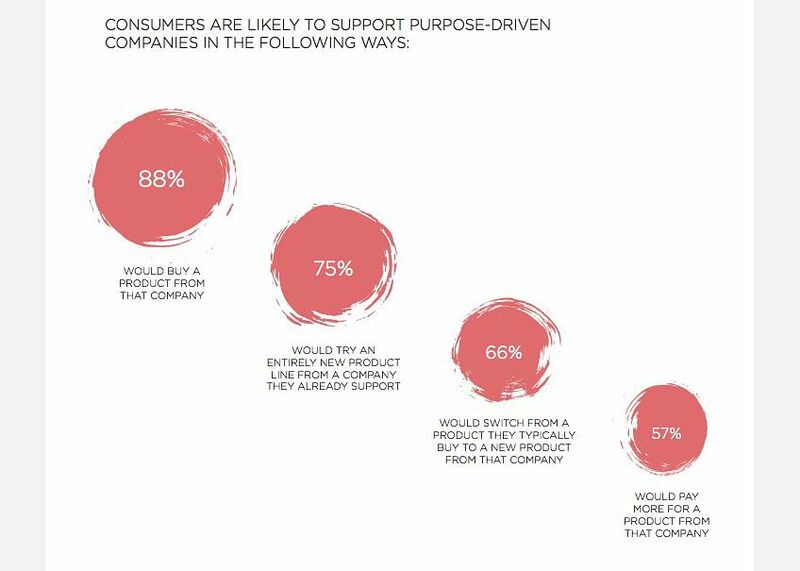 By creating intimate connections with consumers, purpose-driven brands are establishing intense loyalty that is hard to shake. Even if these brands make a misstep, sixty-seven percent said they would be more willing to forgive than with traditional companies. But do all consumers share this mindset, or is it just a small part of the population? While consumers across the board are getting in line with purpose-driven brands, millennials are driving the demand for more like-minded companies. Seventy-three percent of millennials are willing to pay extra for products and services from companies dedicated to social and environmental change, compared to just fifty-one percent of the baby boomer generation. Seventy-percent of Gen Z said they would actively engage with a brand that could help them make a difference. Across the globe, China has the highest percentage of consumers who are buying based on beliefs (73 percent). India is close behind (65 percent), followed by the U.S. (47 percent), Australia (40 percent) and the U.K. (37 percent). More generally, fifty percent of consumers worldwide make purchases based on their beliefs. It seems that no matter where you are in the world, or what your age may be, brand activism is becoming increasingly more important to consumer purchasing and messaging decisions. People want to invest in companies with a purpose, they want to share the burden, and they want these brands to integrate with their everyday lives. If you are a brand, what is your purpose? Does it only exist to fuel your own growth, or does it move people to join, grow and celebrate along with you?